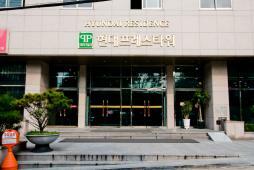 Hyundai Residence, opened in September 2005, is part of Hyundai, a representative Korean company. There are 165 guestrooms (103 guestrooms excluding lot sales) total with a selection of 13 pyeong, 15 pyeong, 17 pyeong and 22 pyeong rooms. All rooms are equipped with furinture, electronic appliances and tableware. Designed in simple interior, it provides perfect rest and comfort. A LAN line is also available for guests with laptops in addition to the complimentary Internet access in the 15th floor business center. Located at the heart of Seoul, Hyundai Residence is near Myeongdong, Dongdaemun Market, Chungmuro, Jongmyo, Insadong and other tourist attractions. Within walking distance are subway line 2,3,4 and 5 for convenient transportation. Bupyeong Market, Nangmyeong restaurants, furniture stores and Mokjeok Park are also easy-to-reach local sites. · Microwave : Free for use on the first floor. ※ Please paid to the hotel directly. As for the charges it may be changed by the circumstances of the Residence side.